I’m so excited to share my new monthly printable series with you all today! Do you love I spy activities? If you do then you’re in the right place! I’ve combined I Spy activities with my love for seasons and holidays to create a themed printable each month. Even more exciting is these worksheets are free for the entire month of the theme! 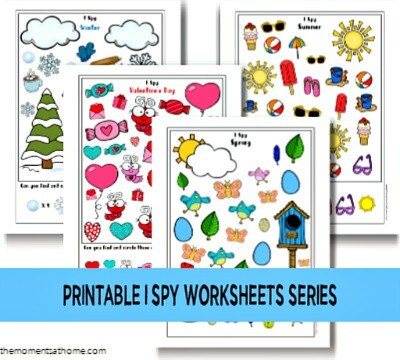 Subscribers to my Printable Worksheets for Kids email blasts will have first access to seasonal I spy worksheets and other new printable activities. This series launches later this week with my first I spy activity! I do blog to make a little extra cash to pay for my kids’ extracurricular activities, no shame here. That’s why I’m offering the entire YEAR of I spy printable worksheets in my TPT store Rainy Day Work. Each month’s themed printable will be shared here on my website with free access for the entire month. After the month ends the printable will only be available within the packet at Rainy Day Work. So don’t worry, you can get them for free here! Also, bonus themes will be added as my creativity sparks. These I spy printable worksheets are made for younger kids meaning they’re pretty simple. Stay tuned for I spy worksheets for older kids! Again, the series here on the blog launches later this week so sign up for email blasts for first access! Have you visited my website for parents of older kids? It’s called Tween Parenting and it relaunched in 2019! I’ll be sharing I Spy worksheets for kids ages about 9-12 along with crafts and activities for tweens. We also share parenting tips and resources for you! Join our Tween Parenting Facebook community and get the conversation started!